Bingo and opera: where else but the Heights? A couple of recent announcements show just how diverse the Heights is. Opera in the Heights has announced a change in artistic direction (Houston Press ArtAttack) and the local bingo community has learned that an offer has been made to purchase the local SPJST Lodge #88 in Greater Heights (actually Shady Acres). How many communities have opera and bingo nearby, much less attended by similar crowds? Senior citizens are what you would expect at a local bingo hall, and in the past this has been true. However, Shady Acres has changed tremendously over the last few years. It is a young, trendy location now. The Thursday night bingo is a place for young locals to hang out. The cheap beer may be one of the reasons it now sells out. Evidently a $10 million dollar offer was made for the property. Ten acres near the Heights would be a fantastic opportunity for a builder. The members have been asked to vote on it. The members will vote “no” of course. Even if the head honchos decide to take the bucks instead of adoration…$25/SF is kind’a cheap. That was 2012 pricing. “The consensus has been that it will not be sold at any price,” and that the leaks about potential sale are premature. Now, back to Opera in the Heights, a local opera operating out of Lanbert Hall at 1703 Heights Blvd. It is taking a new direction, involving shorter operas and more local talent. Opera in the Heights’ artistic director, Enrique Carreón-Robledo, has stepped down. The season’s two remaining productions will be lead by Eiki Isomura, director of orchestras at Lone Star College-Montgomery. He will act as interim conductor. 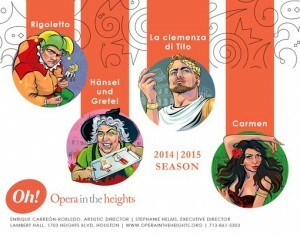 More details of Opera in the Heights here in a Chron article.